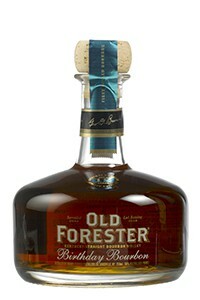 August 28, 2015 – Old Forester is celebrating Brown-Forman founder George Garvin Brown’s 169th birthday this coming Wednesday (September 2) with the 14th annual release of the Old Forester Birthday Bourbon. As with the previous releases, this year’s edition comes from a single day’s production – in this case, June 13, 2003. However, the 2015 edition is the first in the series to be bottled at 100º proof (50% ABV). Only two other Old Forester expressions are bottled at that strength: Old Forester Signature and the Whiskey Row Series 1897 Bottled in Bond. According to Master Distiller Chris Morris, this year’s edition is unusual for a second reason. “This particular lot of barrels is unusual because it matured in the same warehouse location instead of multiple sites,” he said in a news release. “The lot aged near a window and close to a heat cycling duct, exposing all of the barrels to very high temperatures, resulting in the very robust, intense wood-derived characteristics exhibited by this exceptional vintage.” 13,200 bottles (2,200 six-bottle cases) will be available starting in September at whisky specialist retailers in the US, with a recommended retail price between $69.99 and $79.99 per bottle. Brown-Forman broke ground last month on a new downtown Louisville distillery for Old Forester to be completed in 2017 as part of the revitalization of the “Whiskey Row” area along Main Street. The distillery will include a visitors center, along with warehousing and cooperage facilities.